New features such as online reservations and a burger barge are coming soon. LONG BEACH—What if you were told you could have the same atmospheric boating experience as visiting Catalina without having to sail too far from SoCal’s shores? Belmont Mooring Co. has created a mooring field near Island White off Long Beach, which The Log reported on back in 2015. When the story first broke the mooring fields were more of an experiment. However, owner of Belmont Mooring Co., Micheal O’ Toole, reported the moorings have become quite the success. “We’re getting more and more locals,” says O’Toole, who described how he’s seeing boaters come out to stay each weekend. “It used to be that you’d have boaters saying their goal is to get out to Catalina five times this summer. People are using their boats a lot more because it’s [reserving a spot with Belmont Mooring Co.] so simple,” continues O’Toole. Recreational boating is certainly a calling, but with the bustle of hectic life on land, it can be difficult at times to get onto the sea – which is why local boaters love Belmont Moorings. “We’re creating a new little world out there,” says O’Toole, who adds the moorings are becoming similar to “a Catalina atmosphere” where boaters can BBQ, hang out on their boats and have fun. In recent articles, The Log also covered the dangers of Catalina storms. 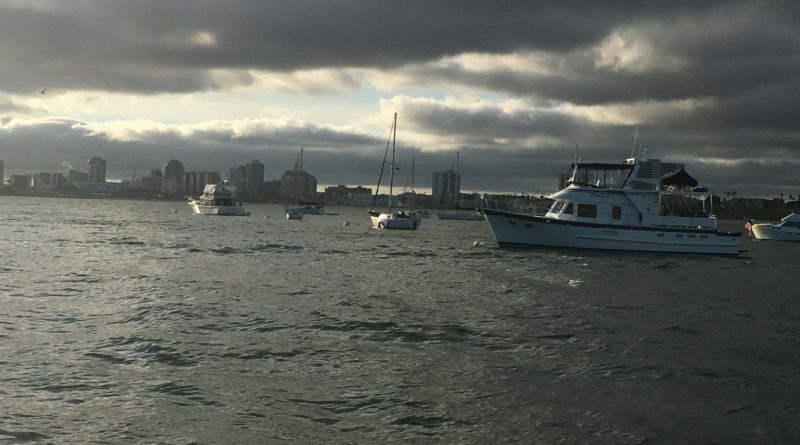 Because these mooring fields are much closer to the Southern California coast, O’Toole is finding many boaters are planning “staycations” on their boats closer to home during the winter season. When The Log called Belmont Moorings Co., the website was down for updates. O’Toole said currently the website is undergoing a revamp to give people interested in booking a buoy more information on regulations, the option to book online and more. According to O’Toole, the new website will be live within a week or so of this article going to press. The Log also received a sneak preview of the website, which advertises Belmont Mooring Co. as an environmentally friendly mooring installation/management company. Overnight anchorage is only permitted on weekends, from Friday to Sunday nights. As promised, the rules and regulations for renters are provided, including information on noise, generators and even pets. One attraction O’Toole stated is in the works is a burger barge, where a pontoon would offer burgers for sale. Boaters out on the water will be able to order fresh BBQ without having to leave their boats. Booking one of the mooring spots is easy. Customers can call O’Toole at 562-881-0567 or text to the number above with requests for a reservation. For those interested in making a reservation via text, send a message to the number above with your boat’s name, size and estimated time of arrival. From there, Belmont Moorings Co. can set you up with a reservation including sending confirmation and user regulations. For more information about the bookings, visit the website at belmontmoorings.com. Oh please, unless you can get a buffalo milk and see bison shortly upon landing there’s no substitute for Catalina. Good seamanship, navigation, and weather rewards those whose course is set for the island. Catalina rewards those who prudently navigate to the respective shores given the right weather.